This may not seem at first to be a very appetizing subject, but a wonderful oped in the NY Times today explores whether eels were part of the first Thanksgiving meal. I've encountered eels only twice hereabouts: a tiny one in the Millstone River below the dam in Kingston, and a large one that scrambled upstream when they drained the upper Mountain Lake this past summer. Turns out they were once a main source of food, and quite tasty. The fascinating story of these locals, who swim 1000 miles out to the Sargasso Sea in order to breed, can be found here. The oped is relevant to discussions in progress about how the series of small dams along the Millstone River can be made less obstructive to the movement of migratory fish heading up towards Princeton from the Atlantic Ocean. Among migratory fish, the most familiar are anadromous species like salmon and shad, which live in the ocean but breed in freshwater streams. Eels are catadromous, meaning they live in freshwater, then head out to sea to breed. Drinking water is easy to take for granted. It emerges on demand from the faucet in a seemingly endless supply, and dutifully disappears down the drain a moment later. With that brief moment in the light--the free fall from faucet to drain--the water is transformed from useful commodity into public burden. After living in Princeton for seven years, I decided it was time to learn something about the water's journey to and from the kitchen sink. Fortuitously, I met a neighbor last year at the annual park picnic who regulates water at the state's Dept. of Environmental Protection. He retrieved a map from his home and started drawing the outlines of the watersheds that serve as our water supply. 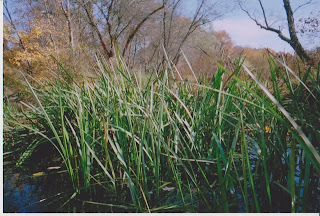 Though a small portion of our water comes from wells down in Rogers Refuge, below the Institute Woods, most of it comes from surface waters, specifically the Millstone and Raritan Rivers, with a little input from the Delaware Raritan Canal. At this year's picnic, he suggested we canoe down the Millstone to the water plant that cleans the river water and pumps it back to our homes. One way to understand where our drinking water comes from is to step outside in a rain. In Princeton, the water flowing off our roofs and down the streets disappears into stormdrains that feed mostly into Mountain Brook or Harry's Brook. Mountain Brook on the west side joins the StonyBrook. In eastern Princeton, the Stonybrook and Harry's Brook join the Millstone at Carnegie Lake. By the time the water reaches the dam at Kingston, it's all called the Millstone River, which heads northeast, running parallel to the canal (the squiggly blue line heading up from left to right on the map). 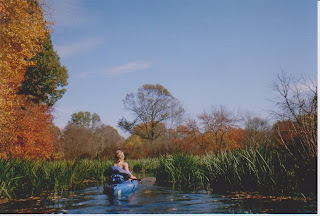 In late October, my neighbor Paul, friend Steven, my daughter Anna, and I set out to canoe the route Princeton's runoff takes to the water plant. We drove the first part of the route. First stop was just below Kingston on River Road, where Princeton's cleaned wastewater (from our homes) enters the Millstone. The sign boasts "Over 95 billion gallons reclaimed." Farther downstream, we stopped at a nice bohemian cafe for coffee and locally produced ginger ale. Our put in spot was located across the river from the cafe, just below the Amwell bridge. The Millstone River turned out to be a beautiful wooded corridor. The yellows of hickories and the reds of tupelos made bold statements on the hillsides. Sunlight reflected off the rippled water surface onto trees, making graceful rings of light that slowly paraded up the trunks. Cornfields could be seen through the woods, planted in the broad floodplain much as Indians may have long ago. A friend later told me these tree roots guarding the shore looked like they were out of a movie set for Lord of the Rings. Anna enjoyed occasionally getting pulled along by Paul, who held the rope to her kayak in his teeth. This is one of two dams the river flows over between Princeton and our destination at South Bound Brook. Interestingly, the Stonybrook/Millstone Watershed Association would like to see these dams modified or removed so that fish like shad could swim up the Millstone in the spring to spawn. We lost Paul on the downstream side of the dam. Turned out his curiosity had been piqued by a shadowy, circular object resting at the bottom of the river. Could it be the very millstone from which the river got its name? Further on, we encountered some funky dwellings along river's edge, with elaborate armaments meant to keep the river from undermining the homes. After two hours of scenic drift and dabbling in paddling, we reached the grand confluence of waters from which Princeton's drinking water is taken. A portion of canal water entered from the right. The Raritan River came in from the left. Before the joined waters tumble over the dam on their way to the Atlantic Ocean, water treatment plants on either side withdraw what becomes drinking water for many municipalities in the area. The water from our homes and streets, then, joins with the natural flow of nearby brooks and the Millstone River on a 20 mile journey downstream to the confluence with the Raritan River, where a portion is pulled out, cleaned to high specifications, and pumped back up to our faucets. A forty mile journey in all, with two cleanings inbetween--a lot of work for that fleeting moment of utility in the house. We carried our boats up the slope to one of the locks for the Delaware Raritan Canal, where we had parked our other car. On the way back, we passed an interesting bit of shrubbery that looks like it was manicured with the blades of a helicopter flown upside down. Part of our motivation to canoe the stretch was to scout out possibilities for an organized event for people to canoe down the Millstone or bike along the towpath. Turned out the Stonybrook/Millstone Watershed Association was already planning such an event for this coming spring, to highlight efforts to make the Millstone more accessible to migrating shad. Steve Kruse, of the Princeton Bicycle and Pedestrian Advisory Committee, found articles about shad in the Millstone here and here. A little curiosity about our drinking water led me to a great recreational corridor for people just downstream of Princeton--one that hopefully will also become once again a corridor for shad and other migratory fish. This past Saturday, on a classic fall day, I led a walk through Community Park North and Mountain Lakes. This is the time of year when trees and shrubs emerge from their green camouflage to announce their identity in bright colors. Scanning a hillside, one can quickly inventory the woody constituencies it serves. I keep thinking the leaves should have numbers on them--1 for yellow, 2 for orange, 3 for persistent green, etc. The first photo shows spicebush in yellow, competing with the persistent green of honeysuckle shrubs. Orange this time of year at Mountain Lakes typically means Asian photinia. It was easier to appreciate their beautiful fall color before it became apparent they were taking over large areas of the park. This closeup shows the Asian Photinia's obovate leaf (wider towards the tip). Viburnum dilitatum, which unfortunately is also an invasive, has its own color scheme. Catalpa, with its big oval leaves, pops up in the forest as it does in people's backyards. The native hazelnut (note catkins on the left that emerge this time of year) numbers only three or four individuals at Mountain Lakes. We're trying to get more of them growing. Towards the end of the walk, we stopped by the eponymous lakes, where repair of the dams is coming along nicely. Several days later, I stopped by to find tree stumps dropped in a heap in the upper lake. These, saved from a small patch of woods that had to be cleared for the contractor's staging area, will be secured to the lake bottom as fish habitat. The winter storm that downed hundreds of trees in Community Park North and Mountain Lakes obliterated portions of the trail heading up to Witherspoon Woods. The Friends of Princeton Open Space trails committee soon established new trails to sidestep nature's logging operation, but many regular hikers were asking when the old trail would reopen. Clark Lennon, who has done so much to improve trails at Mountain Lakes and elsewhere, finally took chainsaw in hand and spent three days cutting through the horizontal forest. "Fifty one trees! ", he reported. Just to the left of this scene, in openings left by the storm, grow three native American Chestnuts, planted by Bill Sachs this past spring, then watered by Bill throughout the dry summer. These are two of the labors of love that enrich life in Princeton. Norway Maples Say "Here I am." Now is a good time to spot all the Norway maples springing up along your fenceline. They sprout from windblown seeds and grow well in the shade, advertising their location this time of year by turning bright yellow when most other trees are bare. This photo, taken along the Guyot pathway near Valley Road, shows a Norway maple pushing up into the canopy of a native pin oak. This is the urban version of forest succession, and is not necessarily a good thing. Norway maples are largely inedible to wildlife, and discourage other plants with their dense shade and growth inhibitors released through their roots. It's a good idea to remove them from your fencelines before they get too big to cut by hand. and ginkgo leaves ornamenting the sidewalk along Hamilton. None of these are native species, but only the Norway maple is invasive. A neighbor of the much-used Guyot pathway (behind Conte's, and bordering the back of the Valley Road soccer field) has organized a workday for tomorrow, Thursday, Nov. 18, at 1pm to remove some invasive shrubs along the edge of the trail. We'll focus on liberating some of the natives from exotic competition. If you'd like to help, bring work gloves and meet us along the trail. if not for the timely intervention of private landscapers who dutifully blow all the leaves into the street. True, blocking sidewalks and roadways with nature's fertilizer may seem counterintuitive to the untrained eye, but THE CLAW must be fed. THE CLAW has been observed forming symbiotic relationships with a dumptruck, which hauls the leaves off to a stronghold where even larger machines can feast upon them. A vulturous creature often follows behind, eating whatever scraps remain. Less likely to survive evolution's rigors is another highly mechanized caravan moving laboriously through a neighborhood nearby. Lacking a claw, this beast probes the asphalt with a proboscis, inhaling all that its attentive servants place before it. Motorists keep a respectful distance, well aware that the beasts must be allowed to feed undisturbed, lest they turn on their supposed masters. One of the perennials that keeps growing in my mind is puzzlement over why people dump leaves on the street each fall. All that good fertilizer and organic matter piled on the asphalt, as incongruous as a beached whale! One contributing factor I've hit upon is that most yards lack "rooms." If the yard can be considered an outdoor extension of the indoor living space, it makes sense to divide it up like we divide up our indoor space--into compartments each with a different purpose. The typical yard has shrubs pushed against the house and fenceline, defining only one sprawling "room" that extends uninterrupted to the curb, all of which is then required to be ornamental. 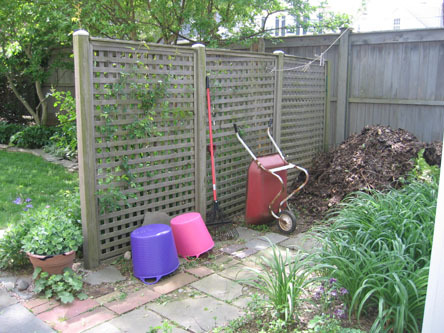 If, instead, we use shrubs or wooden walls to define and obscure small utility areas in our yards, it becomes very easy to store leaves while they decompose and slowly return to the soil from which they came. Nature's miraculous trash-free economy is then allowed to function, and we're spared a big mess in the streets and the considerable municipal cost of hauling, grinding and mechanically turning leaves at a distant composting center. The photo shows one such configuration in a friend's backyard. Another version, using shrubs to define the space, is shown two posts prior to this one, below. Work is proceeding apace on restoring the two historic dams at Mountain Lakes. The dams were originally built around 1900 as part of an ice harvesting operation that supplied Princeton with ice for several decades before refrigerators became available. An anonymous donor provided the nearly $3 million needed to fund the restoration and lake dredgings. In the photo, workers are rebuilding the stone facing of the upper dam. Meanwhile, on the upstream side of the dam, new concrete is being added to reinforce the structure. The dirt access road on the right will be removed after restoration is complete. When the lake is allowed to fill up again, possibly as early as this December, the water will regain its original depth of eight feet. Prior to dredging, the lake was barely one foot deep, with seven feet of sediment under that. Seen from the upper dam, the drained lower lake is an expanse of mud, with any remaining fish and turtles huddled in a small area where water remains. Snapping turtles with 2 foot wide shells (they get bigger with retelling) were frequently sighted in the lower lake, and one of them may still be lurking in the remaining water. Fish in the two lakes were removed prior to draining in July, and mostly relocated to Lake Carnegie. Archeologists recently used metal detectors to find some century-old tools buried in mud in the lower lake, left over from the ice cutting era. This time of year, Princeton, like all towns, exhibits two philosophies of yard maintenance that are diametrically opposed. One governing philosophy sees fallen leaves as a valuable resource to be composted or used as mulch and slow-release fertilizer. The other philosophy views leaves as useless and annoying litter that must be banished from the yard. A 10/15 New Yorker magazine article entitled "Blowback: The Suburban Leaf War" describes the point of view that lawns "enhance your property by extending your living space and by advertising your ability to bring nature to heel." A clean yard and close trimming of shrubs exemplifies this view. Scenes such as this, then, replicated all over town, can be seen as a victory for a community shrugging off nature's assaults on imposed order. Dumping leaves in the street, though, has many negative impacts, including making the streets messy and more dangerous. Private purification becomes public hazard. There is a way that residents could have clean lawns AND clean streets, simply by changing the location of a few shrubs. Typical landscaping puts shrubs up against the house and along the fenceline. But these two photos show an easy way to accommodate a pile of leaves in the yard by planting shrubs around an area designated for the leaf pile. The shrubs serve both as a visual screen and as a way to contain the leaves. Here's the view from the street. Privet isn't my favorite shrub. Something like Itea virginica or Ilex glabra would work as a native substitute, but the main idea is to reconfigure how shrubs of any kind are planted in the yard, so as to create refuges for leaf piles that will quickly be flattened down by the weight of snow and benefit shrubs and trees through the steady process of decomposition. Not all leaves need be handled the same way. Here, pine needles and honey locust leaves are so small they can be simply mowed over or raked underneath shrubs to serve as a mulch. Leaves of silver or red maple also tend to "melt" back into the lawn, decomposing quickly. I believe the county extension agents these days recommend simply mowing over leaves and letting them filter back into the turf. Many leaf blowers come with a bag and a reverse setting that allows them to vacuum up leaves and grind them, making an excellent mulch for around shrubs.